10% of U.S. 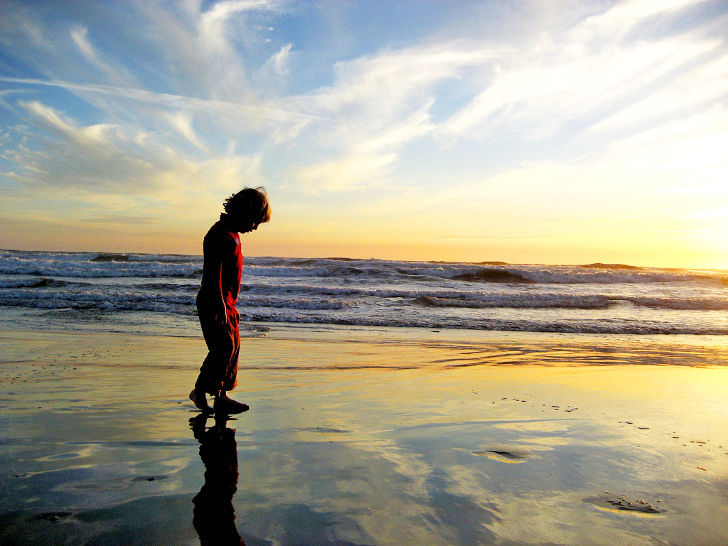 Beaches Are Too Polluted for Swimming: How Does Your Favorite Rate? The Natural Resources Defense Council (NRDC) just released its 24th annual Beach Report, “Testing the Waters 2014,” which identifies the most polluted beaches in the U.S. Shockingly, 10 percent of the nation’s beaches failed to meet water quality standards for safe swimming. The NRDC has released an interactive map to accompany the report, so you can see whether your favorite beaches are safe, or if they are going to give you something more than sunburn to worry about this summer. Almost 3,500 Great Lakes and coastal beaches were surveyed in preparing the report. Of these, 10 percent contained bacteria levels that failed to meet the U.S. Environmental Protection Agency’s most protective benchmark for swimmer safety. The results confirm that serious water pollution persists along the coasts, with massive stormwater runoff and sewage overflows historically being the largest known sources of the problem. The NRDC points out that: “Exposure to bacteria, viruses, and parasites in contaminated water can cause symptoms and diseases ranging from ear, nose, and eye infections to diarrhea, vomiting, hepatitis, encephalitis, skin rashes, and respiratory illnesses.” Um, no thank you! This year, the report designated 35 popular beaches as “superstar” beaches: each has met national water quality benchmarks 98 percent of the time over the past five years. However, the report also flagged 17 beaches as “repeat offenders”: beaches that exhibited chronic water pollution and contamination problems, with water samples failing to meet public health benchmarks more than 25 percent of the time each year from 2009 to 2013. The NRDC’s map allows you to input your zip code and see how your local favorites shape up in comparison to other beaches nationwide. The NRDC has also mounted a campaign to support the EPA and the Army Corps of Engineers as they work to close legal loopholes in the Clean Water Act that continue to allow big polluters to contaminate waterways. If you’d like to do your bit to improve the quality of your local beaches, you can support the campaign by signing the petition here. The Natural Resources Defense Council (NRDC) has just released its 24th annual Beach Report, “Testing the Waters 2014,” which identifies the most polluted beaches in the U.S. Shockingly, 10 percent of the nation’s beaches failed to meet water quality standards for safe swimming. 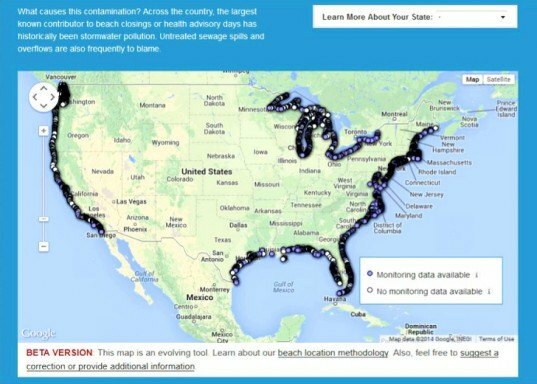 The NRDC has released an interactive map to accompany the report, so you can see whether your favorite beaches are safe, or if they are going to give you something more than sunburn to worry about this summer. Almost 3,500 Great Lakes and coastal beaches were surveyed in preparing the report. Of these, 10 percent contained bacteria levels that failed to meet the U.S. Environmental Protection Agency’s most protective benchmark for swimmer safety. The results confirm that serious water pollution persists along the coasts, with massive stormwater runoff and sewage overflows historically being the largest known sources of the problem.